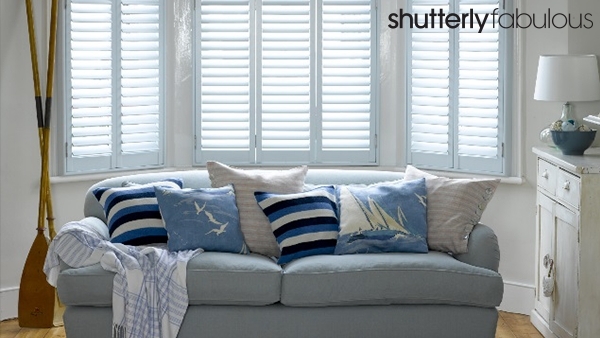 Nautical room themes are trending and shutters are perfect for them. With what seemed to be the longest winter in living history now firmly behind us, we can’t get enough of this glorious summer sunshine. For us, nothing conjures up the summer feeling quite like the nautical trend, which remains a popular theme every summer, year after year. Characterised by the soft blues and crisp whites of the seashore, it’s the perfect theme for a bright and sunny room such as the one pictured below. Shutters are of course perfect for a beach-side theme, conjuring up images of the American East Coast and their beach fronted properties, as well as useful in protecting against the bright glare of the summer sun. Finish off the look with some rustic and worn accessories, (such as the distressed painted trunk in the foreground), coastal prints, and, if you can get your hands on it, an oar or two to finish it off!